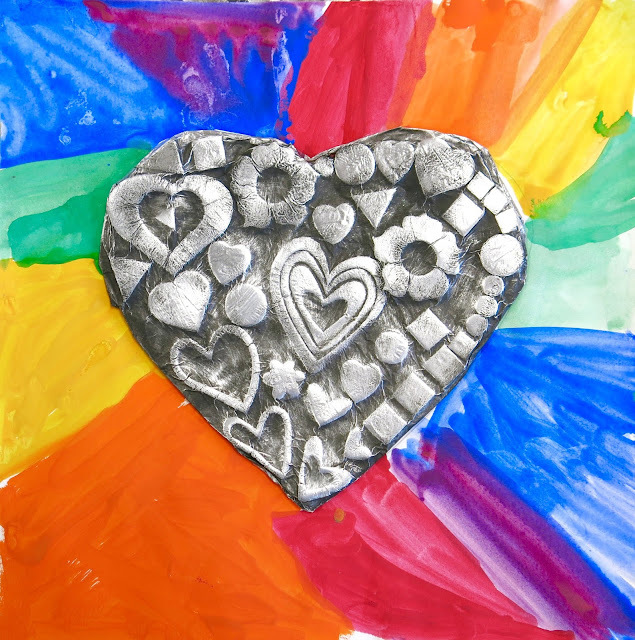 In the Art Room: Kindergarten Hearts, a Follow Up! 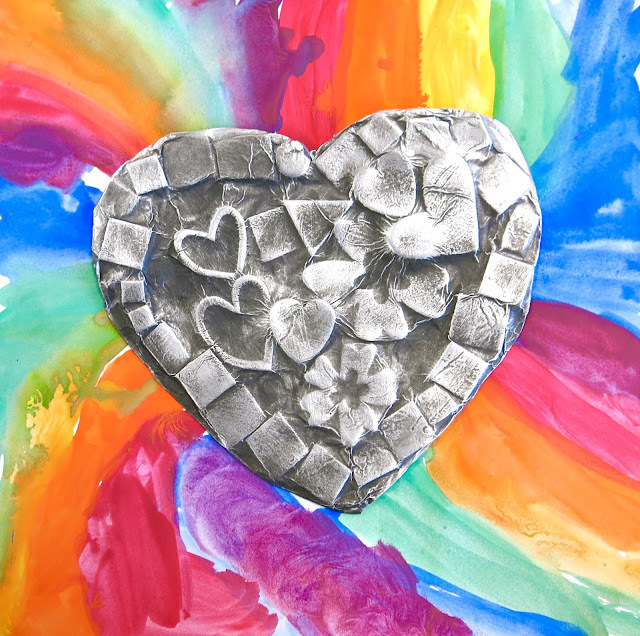 What you see here just might be my new favorite kindergarten lesson! 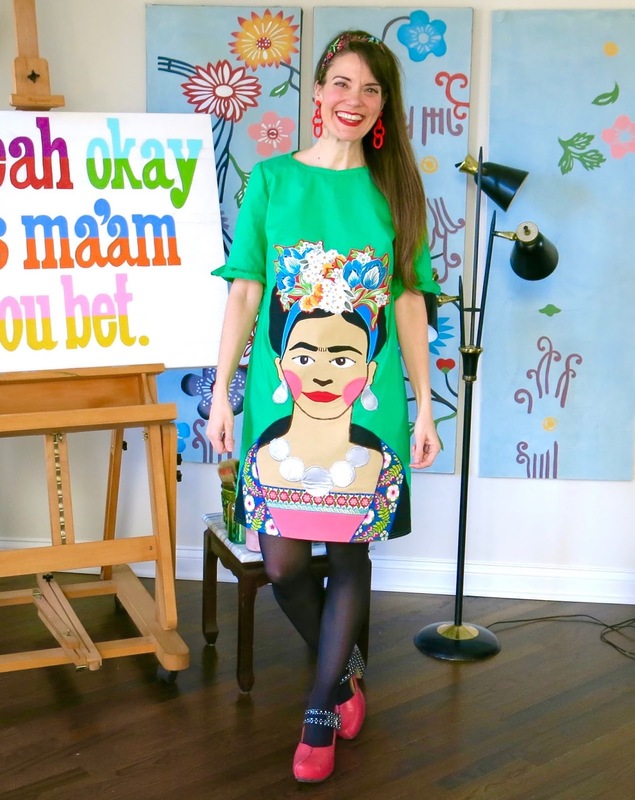 I shared this lesson (and video!) originally here, if you recall. 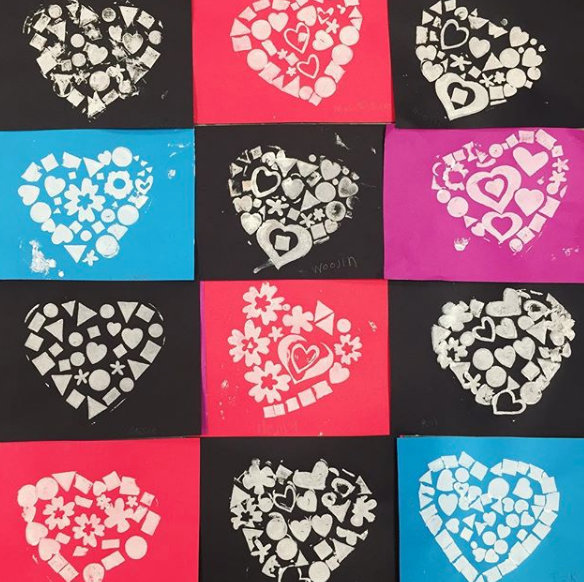 My students began with a foam heart shape purchased from the Dollar Tree. We then added foam sticker shapes and pulled prints (I'll get to that here in a moment but you can scroll down to get an idea). Those prints were used for one project. Then we were left with our printing plates. I LOVE doing this technique with our old printing plates. I've done this same process with cut paper snowflakes, leaves, round printing plates and styrofoam printing plates. I'll explain the process and supplies here...or you can just check out the video. I see my kindergarten kids for 30 minutes, twice a week. Here's how I broke the lesson down. Day 1: We read The Shape of My Heart. We learned about organic and geometric shapes. 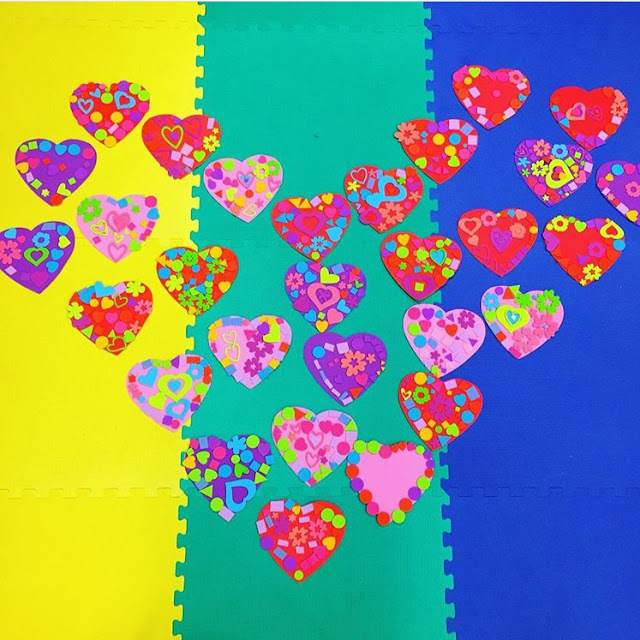 We placed sticker shapes on our foam hearts. The hearts came from the Dollar Tree and the stickers from Michaels. Day #2: We printed! The kids printed by themselves and did great! They were to pull at least four prints so insure they had two good ones. 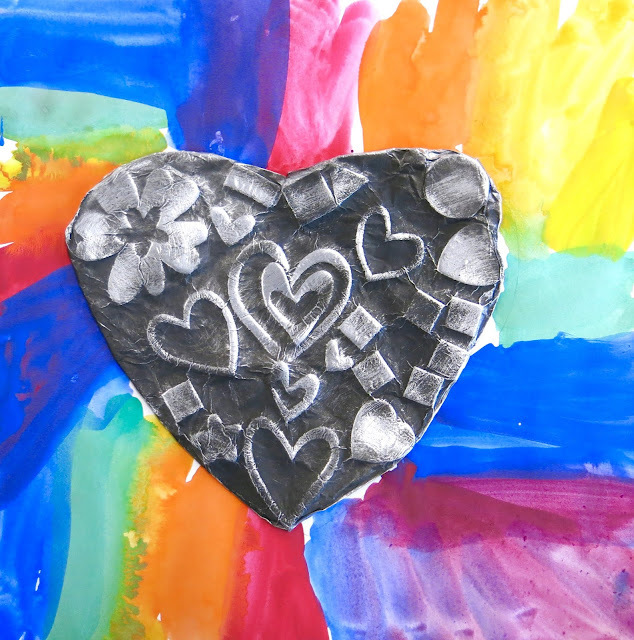 We used foam rollers and tempera paint. You can read more about that here. Day #3: We did the 100 Dot Challenge! At least that's what I called it. Each table had 10 Sargent Paint Sticks. The kids were tasked to making 10 different color dots with the 10 sticks. This fell close to the 100th day of school so it was really fun. We also learned to count by 10s! 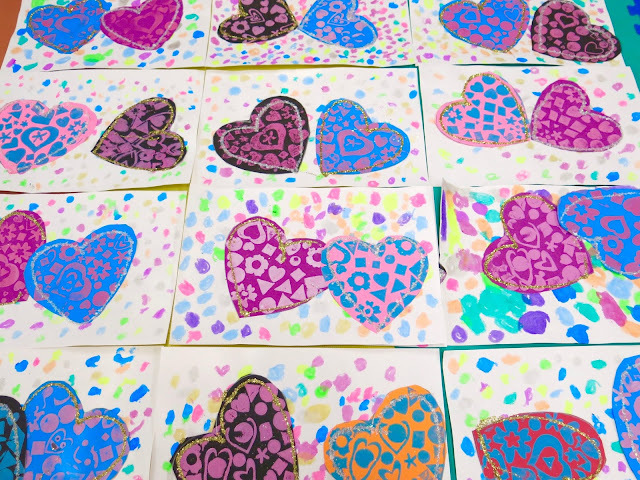 Day #4: We cut out our two favorite heart prints and glued them to our dotted background. Then we went to the glitter table. And, as predicted, GLITTER GOT EVERYWHERE. 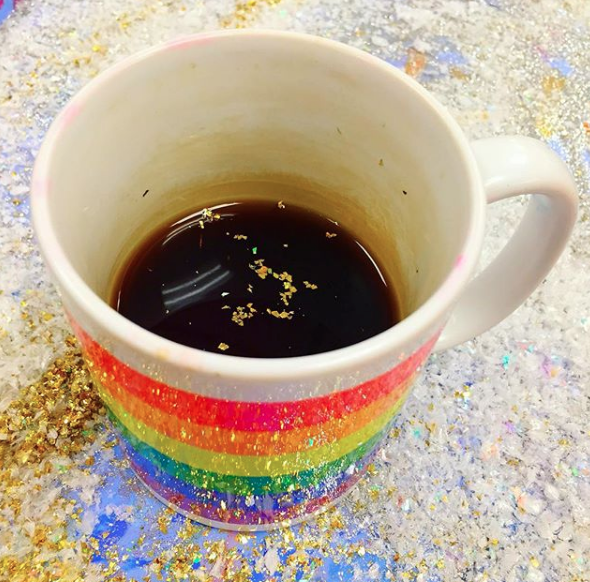 Thankfully a kid pointed out the glitter in my coffee before I took a swig! 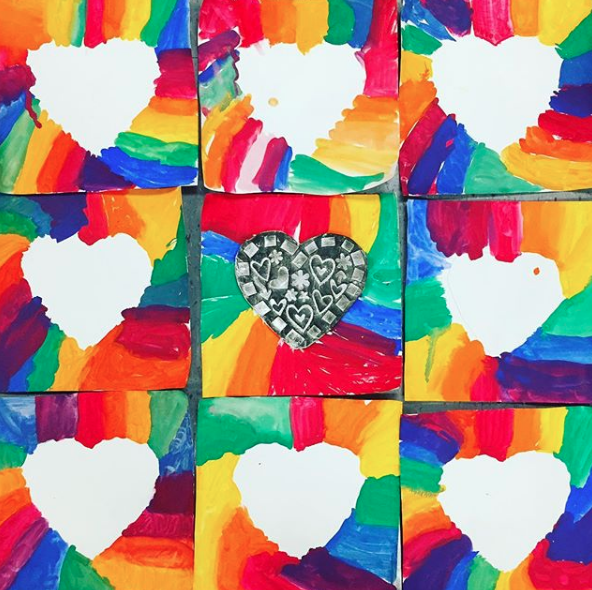 Day #5: We painted a rainbow! I traced hearts in the middle of the paper before the kids got to class. I did this because our focus was on painting, not tracing. I also wanted them to have enough time to pain. Day #6: Our last day...I took the hearts outside. With spray glue, I added the foil on top. Thin foil works best. Then I gave the hearts a dusting of spray paint. I like the $1 a can, matte black spray paint from Home Depot. The prep time for this took me about 30 minutes for 2 classes. Using the finest of steel wool, the kids were tasked with "finding their shapes" by sanding off the spray paint. They LOVED this! They were so excited to see their design come to life. And I hot glued their hearts in place. This lesson had it all: shapes, printmaking, 100 dot making, collaging, rainbow painting, metal tooling and more. This is definitely a lesson I'll be repeating. 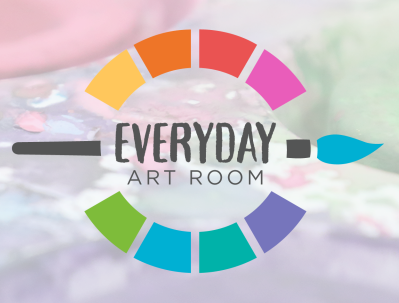 Hope you and your young artists give it a go too! It has been a long time since I forced myself out of my sewing comfort zone. Like, a really long time. 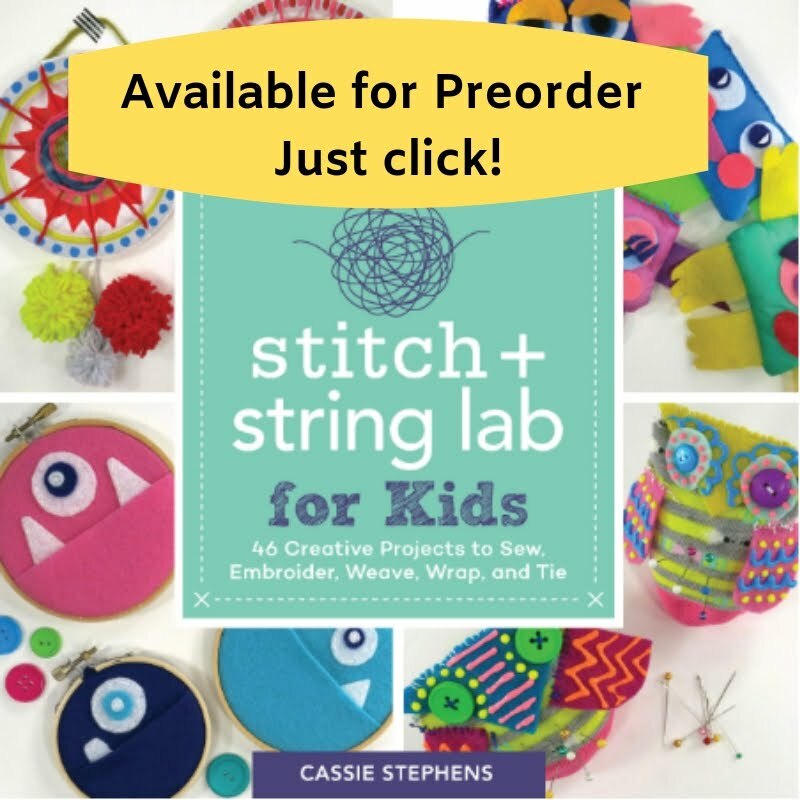 In fact, it's been a long time since I've even sewn anything (I blame the writing of this book for that!). 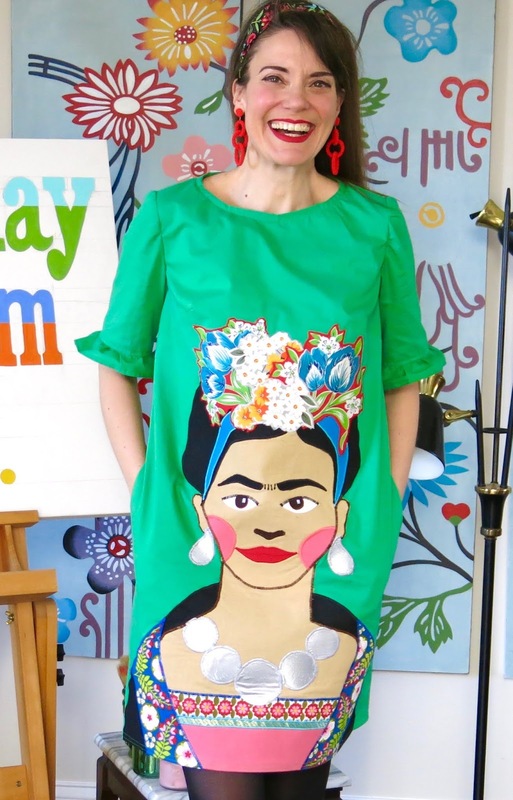 Some months ago, while shopping at the fabric store, the idea to make a Frida dress came to me. 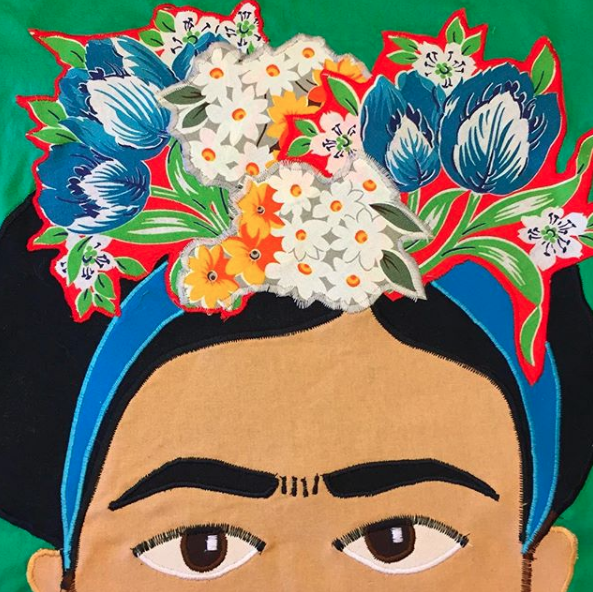 I immediately pulled up the image of Frida with the green floral background and purchased all of the fabric I could in that color palette. I thought "this idea seems beyond my capabilities but if I scoop up all the supplies, I just might try it." And so I did. And, hold on to your pearls, THIS BABY HAS POCKETS! While shopping, I also scooped up a 1960's style shift dress pattern. I knew that a simple front with no waistline would have to be the "canvas" for this kind of creation. Now, y'all know that I'm all about the needle felting...and that's normally how I while away my winter days...but something about the look I was going for said applique. So I started sketching. I cut out and laid the front panel of the dress out on some wrapping paper. 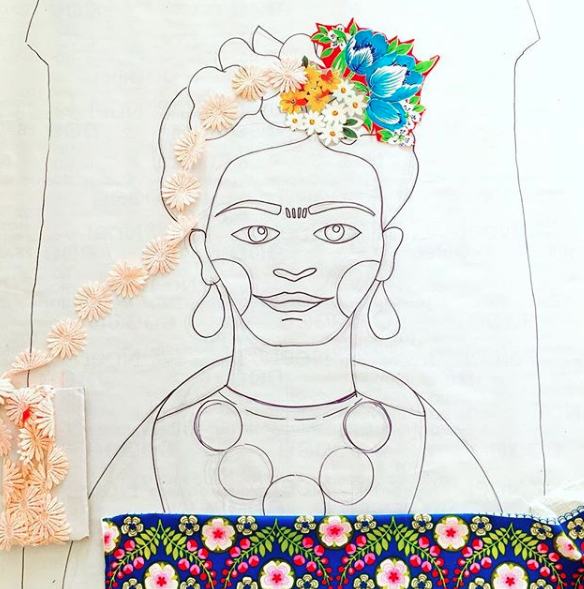 After tracing around the pattern, I started sketching Frida. 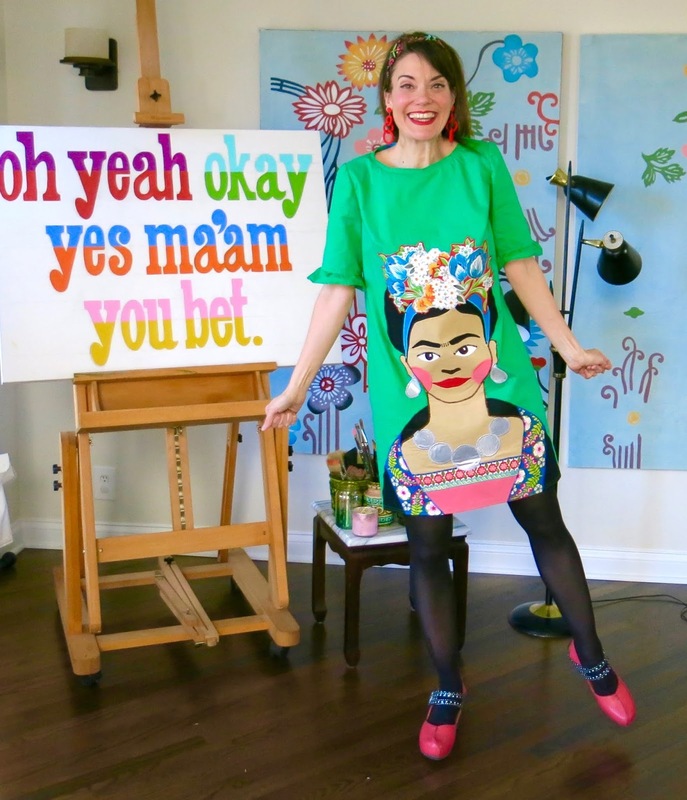 If this Frida looks familiar to you, that might be because I was referencing my Frida latch hook design. 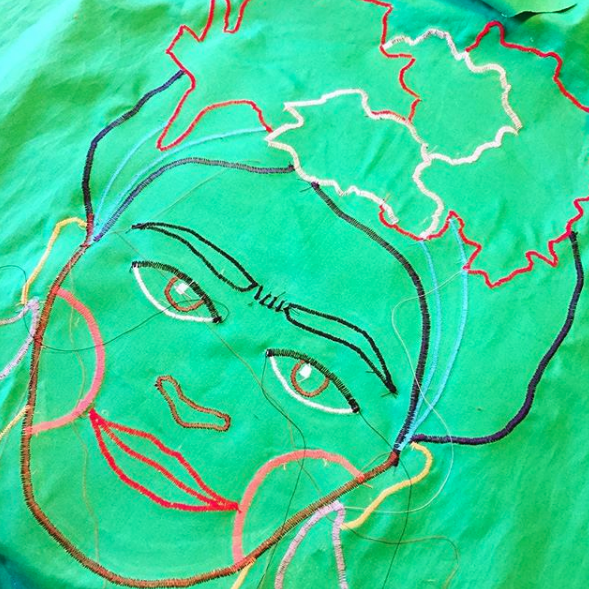 After sketching her out, the REAL fun of cutting out all of the pieces and adding the iron on backing began. 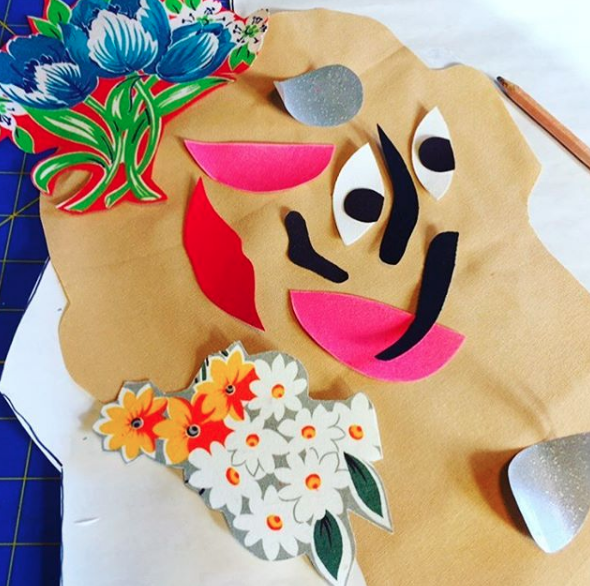 I have done A LOT of applique but I've never used Heat and Bond...like, what?! I guess I just didn't know it was a thing! When I found it at the craft store and used it, I was like WHERE HAS THIS BEEN MY ENTIRE LIFE ON PLANET EARTH? It's that amazing. BUT a lot of work to add to each piece. Once the backing was added, then I simply laid it out and ironed in place. I thought I was doing okay...until I started the HOURS of stitching. Applique is not for the wimps, kids. I went through a lot of back and forth decision making with this dress. First up: to use a floral print for the flowers or stitch flower shapes. I'm happy I went with the floral print. I did something similar with her shawl. Then I had to reach out to my IG fam about thread color. Initially, her face was outlined in peach...but you just couldn't see her jaw line. So I outlined just the jawline in brown...and it looked like a beard. Eventually, I seam ripped the crapola outta the thing and used dark brown for her ears, jaw and neck. And I'm happy with that. Thanks, IG fam! By the way, ANY machine can do this stitch. And look, the back is as pretty as the front! Because the stitching took so long, I totally dragged my feet on finishing! 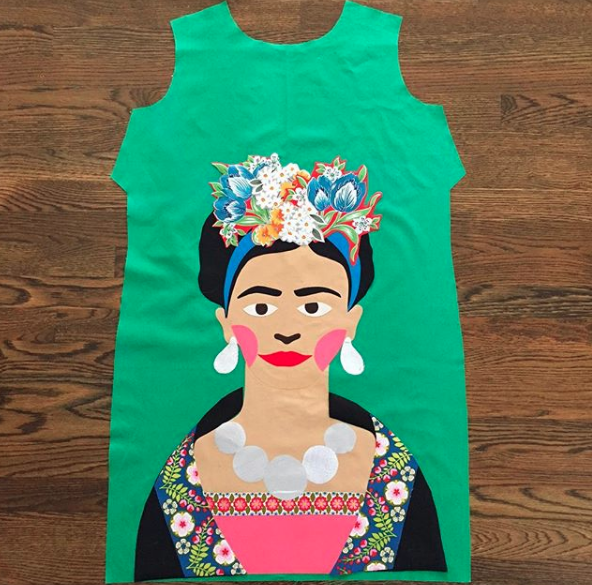 The dress pattern had a couple options for sleeves. In the end, I wanted the dress to have a fun, tropical and retro feel so I went with the sleeves with a ruffle at the bottom. 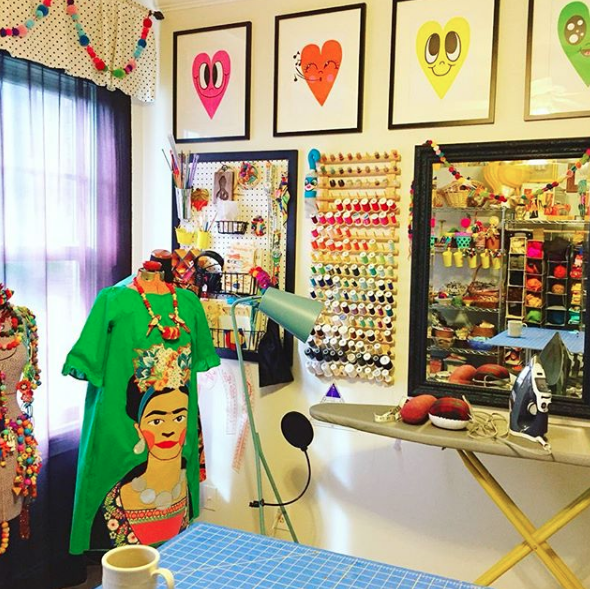 What do I hate most about sewing? Basically everything. Is that crazy? I'm not a detail person, I'm not a perfectionist when it comes to sewing ... and these are traits a good sewist has! But what do I REALLY hate? SLEEVES, y'all. Stitching in sleeves. 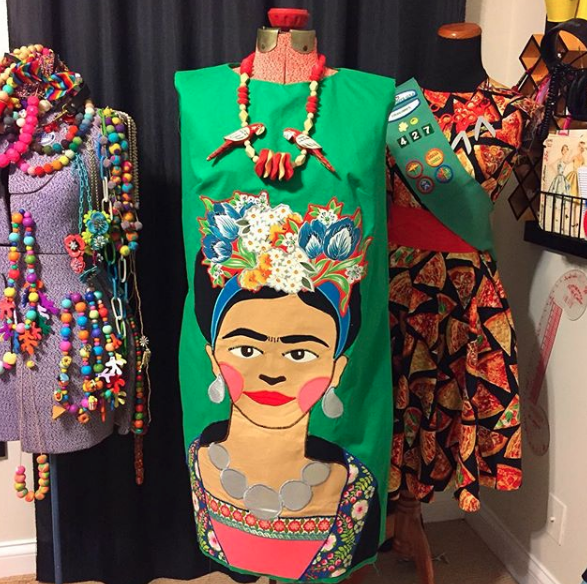 While in sleeve denial, I strolled down applique dress lane. 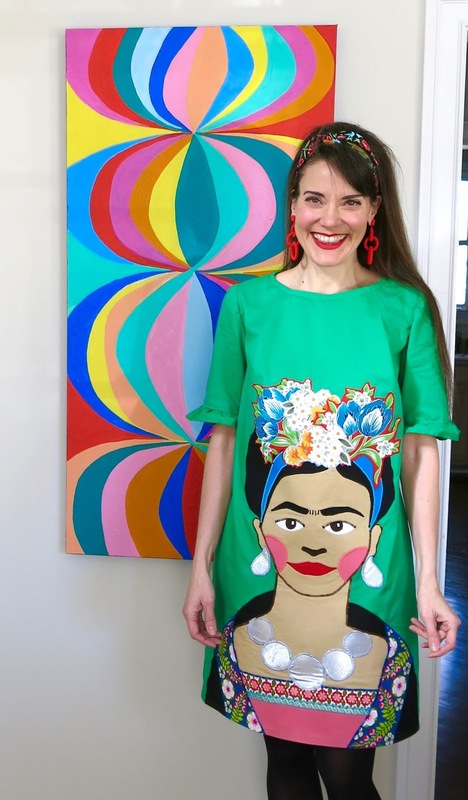 My first applique dress was The Great Wave. 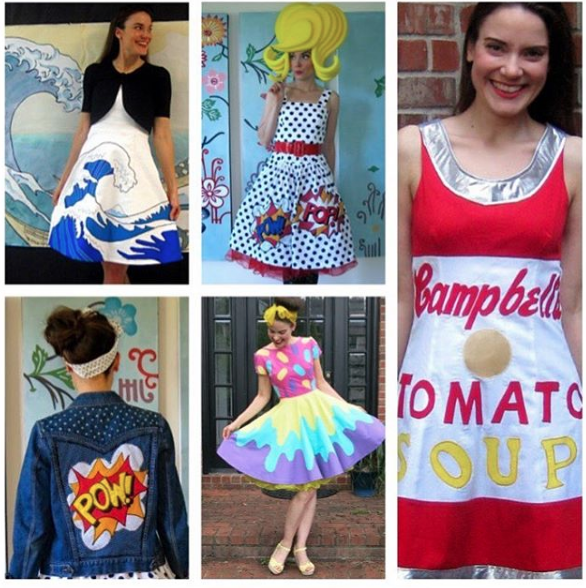 Then I did my Warhol dress, the Lichtenstein pop art number and my sweets number. 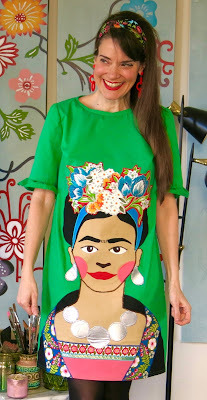 Other than the HOURS of applique, this dress was a snap to make! I love this pattern and have plans for so many more. We'll see how far I get. In the Art Room: Kindergarten Hearts! Not long ago, I was at Dollar Tree and found these foam heart shapes. 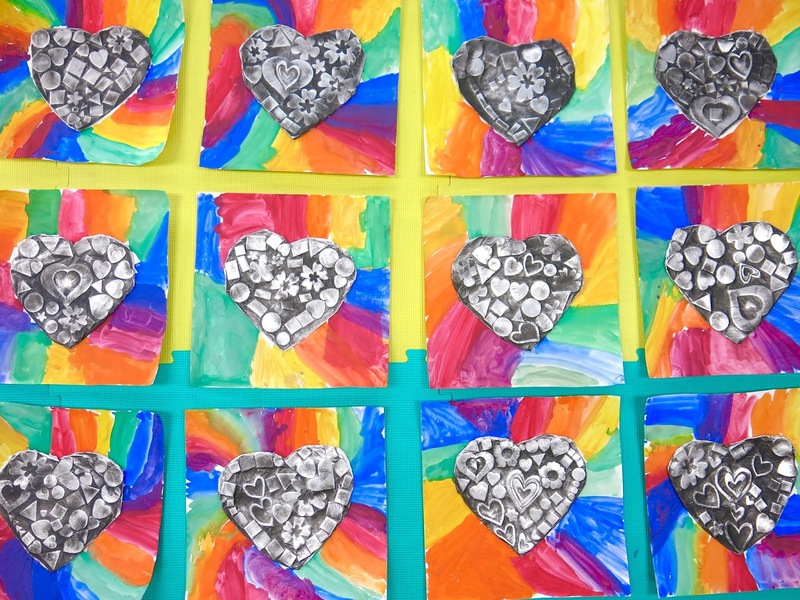 I got an idea to use them in conjunction with the book, The Shape of my Heart with my kindergarten friends. 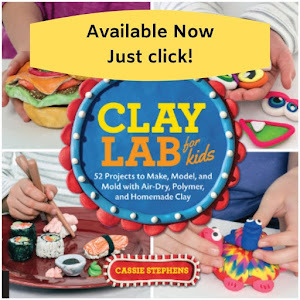 I've ALWAYS wanted to do a project inspired by this book but I just couldn't think of a way to make it work...then, I got the idea to use foam shapes and pull prints. We've been doing it all week and we are loving it. I made a process video for you and your kiddos! I see my kindergarten for 30 minutes, twice a week. 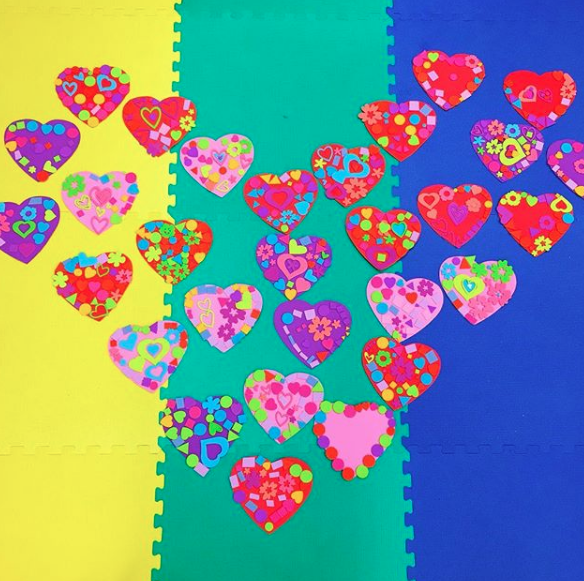 On the first day, we used foam shape stickers purchased at Michaels to fill our hearts. We read the book and chatted about the difference between organic and geometric shapes. And here's a look-see at our prints! Don't you love them!? Each kiddo pulled two prints. Next week, we'll begin cutting them out and adding them to our dotted backgrounds. Details about that in the video. Now, what to do with our heart printing plates? Well...check out that first image and be sure to watch the video! I'm so excited, we'll be making metal reliefs with them. 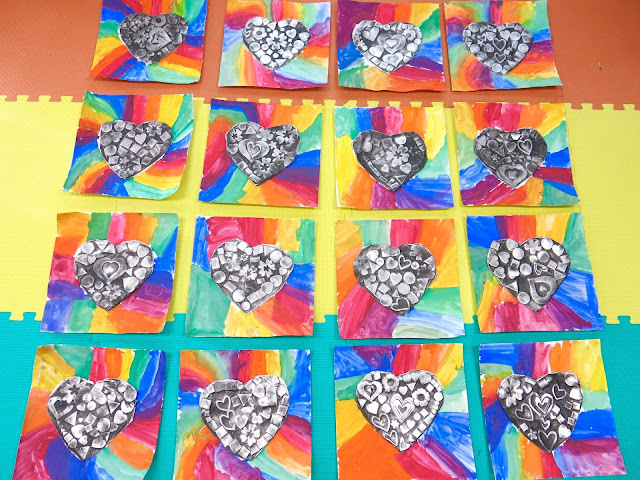 I did not explain the process of how we will frame those metal hearts in the video as I'm still working that through. I'll keep you posted tho. Have fun with this lesson...I know we have been! Do you ever have one of those projects come to you because of a series of events? That's how my Clipboard Gallery idea came to be. 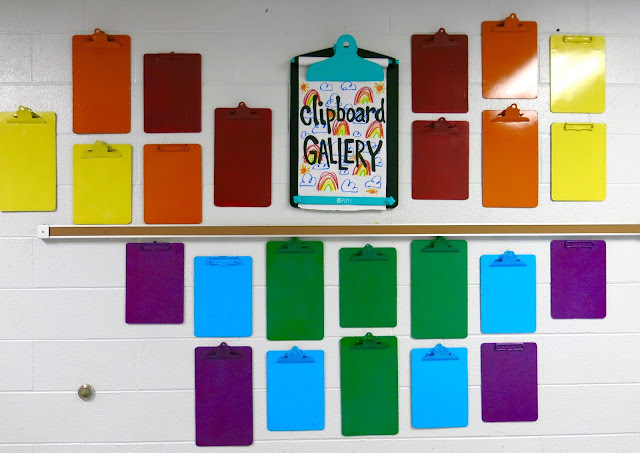 But, before I get in to it, let's talk clipboards in the art room. Do you use them? We do ALL THE TIME! In fact, the original set I were purchased my first year teaching. 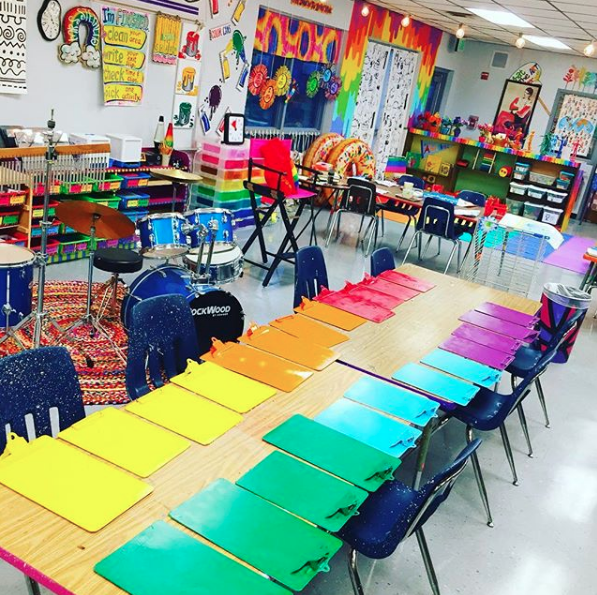 Here's how I use clipboards in my art room: when we are guided drawing together on the floor and need a drawing surface; when tables are pretty messy with paint, glue or chalk and the kids need a "clean" surface for drawing; when my early finishers want to lounge out and draw in my early finisher areas, they grab a clipboard. 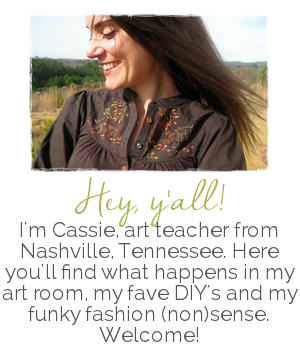 Do y'all use them in your art rooms? 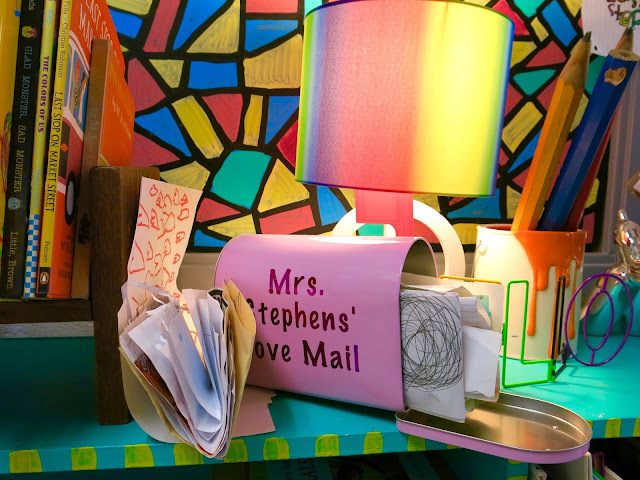 While I love clipboards, my system for organizing them was anything but desirable. I had a huge plastic bin that the kids just tossed them into with a loud clatter. It was ugly, took up floorspace and always overflowing with clipboards. 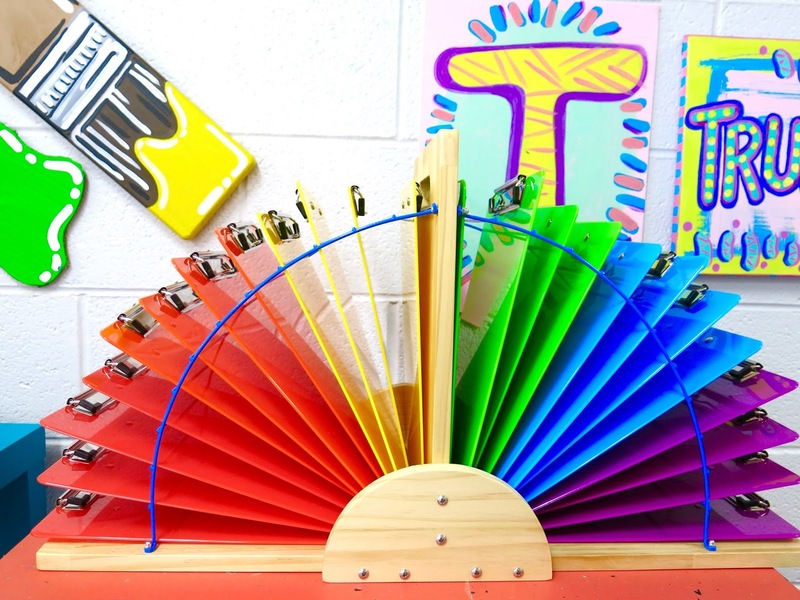 Then an art teacher buddy suggested I check out a clipboard holder...and my life was changed forever. BEHOLD! My amazing clipboard holder! (Cue the angels singing) RIGHT?! Here's the link. The also come in half sizes which can be MOUNTED TO THE WALL! Say what?! But I needed a full set so I went with this one. It holds 24. Some of my classes are larger than that so I do have a small bin under this table that holds my spare ones. Now I had a new problem. My old clipboards were 1. ugly and 2. all sorts of different sizes. So I ordered these in a variety of colors. Rainbow, of course. Have you met me?! What you see here is my Masterpiece Gallery. 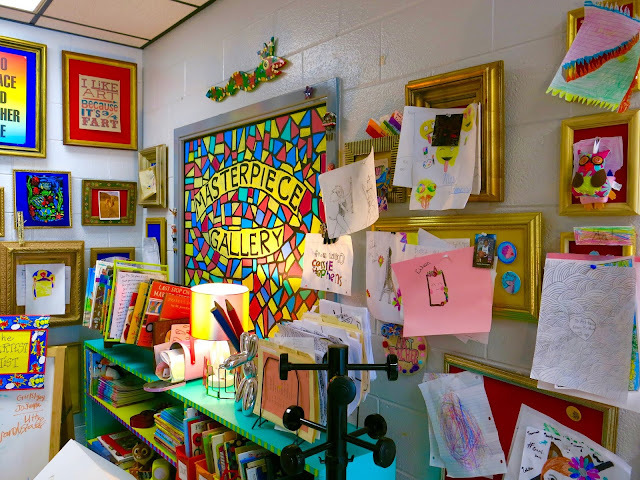 It's my little place in the "foyer" of my art room (I have a big ole room and yeah, I got a foyer) where I like to showcase the artwork the kids create at home. The problem? It's become more like a Mess-terpiece Gallery with pictures hanging crooked, falling down, overlapping. It's a disaster! AND my inbox is overflowing with more sweet drawings! Side note: with 30 minute classes, a lot of my class time was getting eaten away by kids giving me drawings and us chatting about them. While I do love doing that, I just don't have the time. So I got a mailbox this year an the kids put their drawings inside and put the little flag up. They loving doing that and letting me know that there is a surprise inside! BUT, as you can see, it's overflowing too! As I was walking by this mess, I had an a-ha moment. 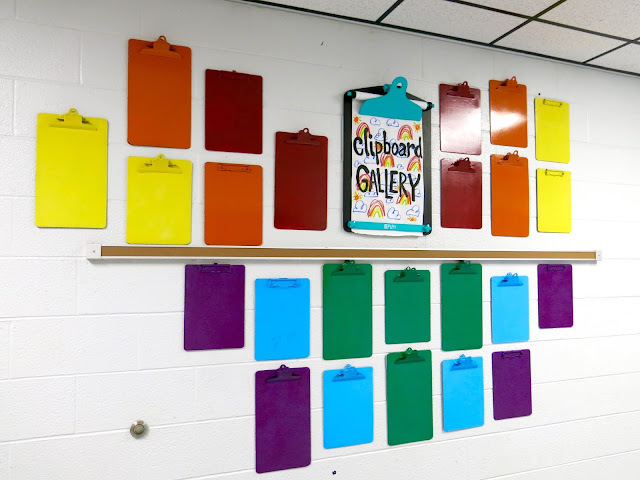 I'd use my old junky clipboards to create another area, outside of my room (as I have no more wall space) to showcase artwork created at home. And the idea of the Clipboard Gallery was born. 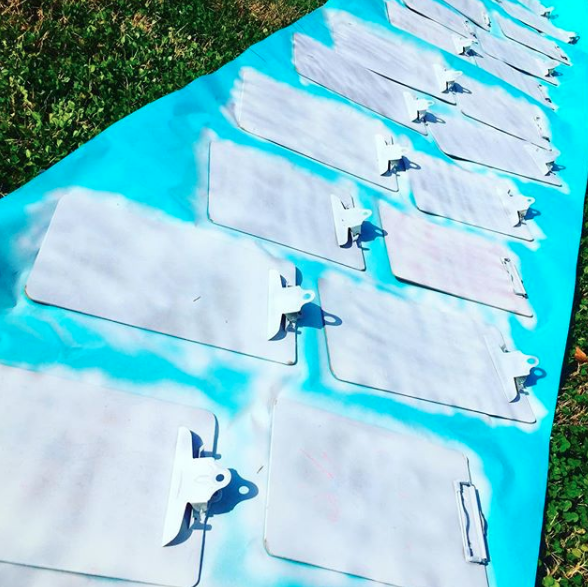 But first, I had to spray paint these guys white as they were a mess! Despite the cold, we had some sunny days this week so it was perfect. Once dry, I spray painted them rainbow-y. Look how well they match my room! 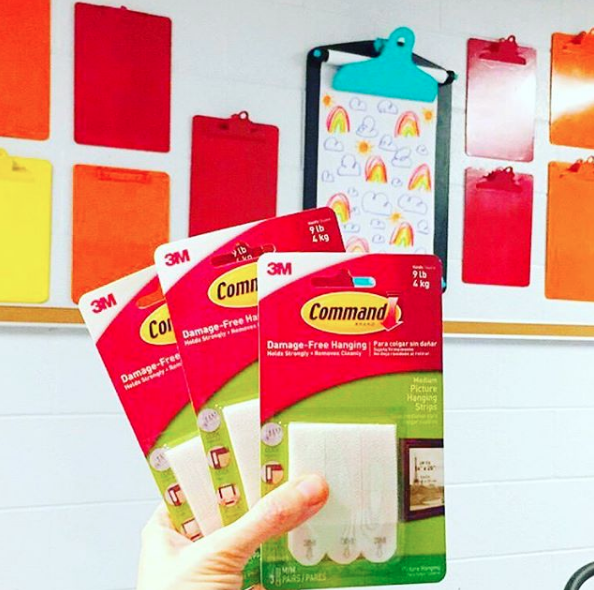 Hanging them was super easy because I always use these 3M Command Velcro strip things. Went up in a snap! The giant clipboard was one I scored at the thrift store a while back for a couple bucks. They do sell them online...the cheapest I found was $30! So I got a steal. 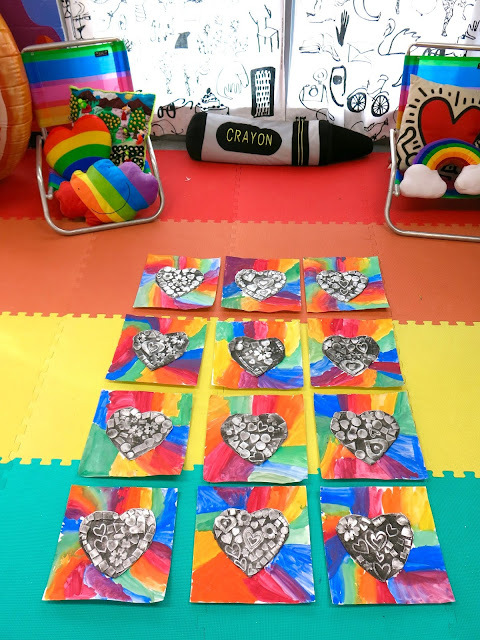 I did purchase more clipboards this weekend at the Dollar Tree so I can add more clipboards...I have a feeling this is going to be a very popular spot to share my students creations from home. How do you all display kids work from home? Love to know!